Tablet owners' use of multitasking while watching TV keeps growing. Of those who have tablets, fully 40% of men and women use them at least once during the day while watching TV. An estimated 22% to 25% use them several times while watching TV. Now, some 20% of U.S. TV homes have one, according to Nielsen. This compares to a 50% U.S. penetration of smartphones in the U.S. The biggest demographic group using tablets are 25-34s -- about 50% of those tablet owners use them while watching TV at least once a day. But older demographic groups are not that far behind: 40% of tablet owners 45-54 and 55-64 use their tablets at least once a day while watching TV. Some of this may have to do with general ownership of tablets. Nielsen says tablet owners tend to be older and more affluent than smartphone owners. Nielsen says nearly one-third of tablet users ages 25-64 check sports scores while watching games -- and a majority of owners use apps while watching TV across the board. By way of comparison, smartphone usage per owner while watching TV is around the same levels as with tablets while watching TV. But female owners are ahead here: Over 40% of female owners use their smartphones at least once a day while watching TV, while men are at a 35% level. 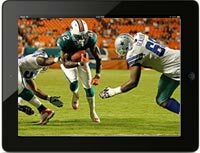 1 comment about "TV, Tablet Multiviewing Rises, Sports Big Draw". Doug Garnett from Protonik, LLC, December 6, 2012 at 5:59 p.m.